I'm the kind of cinephile who is more likely to view a Wim Wenders film multiple times than go, by my own volition, to a Tarantino film. In my circle, there is a joke that started back in '02 when I suppose I was heard quoting a Tarantino interview as featured on a German newspaper. "Die Leute gehen ins Kino, um die Stars zu sehen" meaning: "People go to the movies to see the stars." I was never that kind of moviegoer. It's not the stars that entice my moviegoing. Not in the least. So, this would be a fundamental aesthetic difference between someone like me and the kind of audience that Tarantino envisions for himself. Now, I've gone to Tarantino films, of course. The reason was simple. As the saying has it, 'one for them and one for you.' So, if my people will go to see obscure films with me, then I have to give in and watch other stuff as well. Trust me, I enjoy a good blockbuster a much as the other person. Two words: Sherlock Holmes. That I saw twice by my own volition, of course. Entertainment is better when varied, after all. Tarantino is not without artistic worth. Pulp Fiction was good. No doubt. Kill Bill, I had potential, well not much, but definitely some. 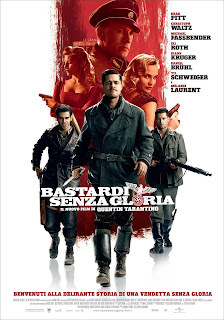 The reason why I wanted to see Inglourious Basterds is because of one thing: satire. I read that he satirizes Nazi notions and Third Reich cinema in quite an informed fashion. I read that he is as comprehensive in his references as 153 minutes allowed him to be. And watch it, I did. Inglourious Basters is the kind of film that would do justice to any college film course that covers modern cinema. Much like an academic, Tarantino's review of literature displays a desire to be thorough and investigative. To truly appreciate this film means one thing: exposure to/understanding of European cinema. I was happy to see so many European and American actors work in such an effortless-seeming way. Action and performance flow so very well. This is a long film (consistent with Tarantino tendencies) but this is not the kind of 'long' that makes one want to look at the watch and fidget. This is the kind of film that makes one want to shower it with all the attention one can give. And, if you're linguistically minded, Holy Cow! The languages spoken in this film are English, German, French, and Italian. I cannot think of another film where four different languages felt like one. Tarantino managed to create an Esperanto-like atmosphere that really impressed me. And the acting? My-oh-my, the acting! I could tell that Tarantino had done his homework most expeditiously in this area. Christoph Wantz' portrayal of the villain colonel is simply breathtaking. Eli Roth's eyes are mesmerising and Brad Pitt's populist language is nothing if not well-delivered. Till Schweiger, the very talented German actor, is another great addition to this cast. As is Daniel Brühl. I cannot think of a contemporary actor who would have played the role of the hero soldier better. Ah, and Mike Myers has a little part in this film as well. I revisited Basterds again this weekend and I was glad I did. Give it a try. If you don't watch much Tarantino, it might just make you think differently of him. I do now. I really like Till Schweiger and was glad to see him in this movie. It;s great that more European actors get such exposure. I didn't know Christoph Wantz and he totally makes this movie! Oh, the soundtrack bits did make me think of previous Tarantino films. I like how he plays with music. Really. I was avoiding this films because I'm not a huge fan of Tarantino. The only thing I've liked of his is Four Rooms, and that was a collaborative effort. Maybe I will give it a chance. I thought he did a great job satirizing the timeframe, too. Frankly speaking, this is the first Tarantino film I have seen, and I must admit, I utterly loved. The cast was brilliant. Christoph Waltz is a great discovery. All actors you have mentioned are so credible, and I can't help myself mentioning that Diane Kruger's performance was also magnificent, though short in time. As for Melanie Laurent, she was not that impressive. I also love the music used in the movie, splendid.